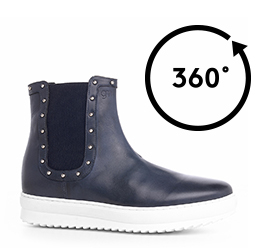 A modern version of the Chelsea boot with a casual style and a slender design. The upper made of fine hand-buffered blue calf leather is enhanced by the studs that adorn the side elastics bands and the edges. The sole is made of ultra-light rubber. The invisible inner elevator system is able to increase height by up to 4 inches (10 cm).